. (1396). چکیده های انگلیسی. میقات حج, 26(101), 167-176.
. "چکیده های انگلیسی". میقات حج, 26, 101, 1396, 167-176.
. (1396). 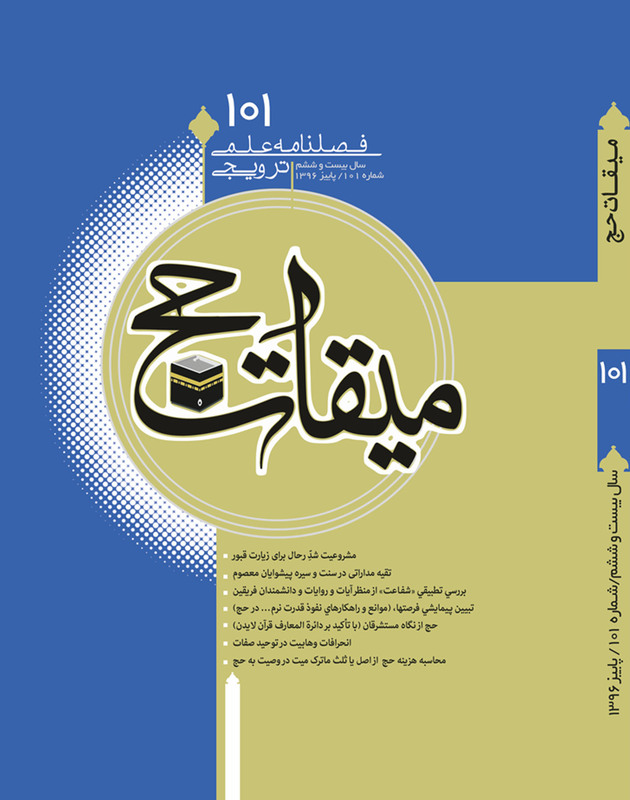 'چکیده های انگلیسی', میقات حج, 26(101), pp. 167-176.
. چکیده های انگلیسی. میقات حج, 1396; 26(101): 167-176. Shadd Al-Rihal and preparing to go to make pilgrimage to holy graves, including the Prophet Muhammad’s grave is not only legitimate but with regard to being a prelude to a mustahabb action (i.e. visiting Imams’ graves), but is also of an intellectual privilege. Some thinkers from the Sunni jurisprudence, however, have disputed the aforementioned minor issue; to the extent that, by citing some nabawi traditions (sayings of the Prophet), they consider Muslims’ traveling to visit these graves as heresy and forbidden, and attribute this ruling to the righteous Salafis. An evaluation of the cited evidence based on Sunni principles of jurisprudence, indicates that the aforementioned theory does not have a place within Islamic jurisprudence, and attributing it to the righteous Salafis is basically void. An investigation into the words and phrases of the great scholars from Sunni jurisprudence will clearly corroborate this claim. Tolerating Taqqiya is among types of taqiyya which includes peaceful coexistence with Sunnis in order to attract their affection and create unity among Muslims not because of fear. Although such taqiyya, on the evidence of narrations, was considered a significant and serious matter during the 250 years of Imamate of infallible leaders, and has been running in social relations and acts of worship, such as prayer and Hajj but in the words of Shiite Fuqahā', except some recent Fuqahā', this sort of taqiyya has not been separated from other types of taqiyya and has been less heeded. In this study, through perusal of the principle of tolerance in prophet's life, position of this kind of taqiyya in life and spoken tradition of infallible leaders has been clarified and it becomes clear from tradition and life of the leaders that this taqiyya is very important to the leaders and it is worthy to be analyzed and recognized by Fuqahā', as in all other types of taqiyyah. Key words: Taqiyya, tolerance, unity. The present article using library resources and descriptive method analyzes the comparative study of intercession from the perspective of verses of holy Quran and narrations and Shia and Sunni scholars. Divine mercy and bounty don't come directly to man, but any blessing is given to man in particular ways. Just as in this world, for example provision, through working and divine mercy, through serving the people and God comes to us, one of the ways of the revealing of divine mercy is the intercession, and not any intercession but the one God permits. The result that will come out here is that the most important thing for intercession is deserving it. And man himself must provide preconditions to deserve salvation, because intercession depends on God's will. In this article, we first have mentioned the terminological and literal meaning of intercession, then we have stated all types of it. Afterwards we've considered mention of intercession in the verses of the holy Quran and narrations. In the end we have analyzed intercession from the perspective of Sunni and Shia scholars. Survey clarification of opportunities, obstacles and strategies of soft power influence of Government of Islamic Republic in Hajj. Considering that the most important goal of this research is to discover, extract and rank the most important opportunities, obstacles and strategies of soft power influence of Government of Islamic Republic in Hajj, the researcher in this study, making use of an accurate and scientific procedure, enjoying the survey (questionnaire) and applying SPSS software - besides his success in discovering and extracting the most important opportunities and threats of soft power of Government of Islamic Republic in Hajj occasion- managed to prove some items which weren’t sometimes assumed to be of the opportunities or threats of soft power influence of Government in Hajj, By the way of scientific method from the viewpoint of the most important clear-sighted scholars in Hajj domain including caravans’ clergymen, Be'theh (Supreme Leader’s representative office) experts and preachers (polyglot) in a questionnaire framework. Keywords: Islamic revolution, soft power, Abrahamic Hajj, opportunities, obstacles, Hajj and questionnaire. The study of the basic and fundamental Quranic-Islamic teachings has been a concern for non-Muslim scholars or in other words orientalists from ancient times. One of their most recent and most important works in this area is the "Encyclopedia of the Qur'an of Leiden" and one of the basic Quranic-Islamic issues is Hajj. Most of the articles about hajj in this work are related to the English Orientalist “Gerald Hawting”. He somehow has linked the rites of hajj and the places related to this practice to the topic of Quran and Islam's origin. The basis and postulates of his explanations and perceptions of hajj merit to critique. It seems that his theoretical foundations based on the lack of revealing of Quran by God, believing in natural origin of religion, and the natural evolution of monotheistic religion of Islam, have resulted in perceptions by him contrary to noble Islamic point of view. By describing and analyzing the opinions and the claims of Hawting, it will be obvious that despite some positive points of his research, his view on the Islamic hajj is incorrect in many cases and can be criticized. Having postulate of lack of revealing of Quran by God, the theoretical basis of anteriority of idolatry over monotheism, natural evolution of religion in societies, in result, casting doubt on accommodation of Quranic mentions of rites of hajj to today’s Muslim’s sites and rituals of hajj, the thought of incompatibility of the hajj verses etc, are among cases about hajj which can be criticized. Given the fact that Wahhabism has the claim of monotheism and fighting against polytheism and with the slogan and the motto of defending monotheism, indoctrinates its goals and intentions to Muslims, it must be seen whether they have a correct perception and understanding of monotheism and unity of nature and traits, and the monotheism of actions and worship or not. Present paper, after reporting the Wahhabism view on unity of traits, examines the most important mistakes and deviations of their viewpoints on the unity of traits and proves that Wahhabis, according to the basis and method they have utilized in understanding the Qur'an and the traditions, don't have a true understanding and interpretation from the deep truths and teachings of religion, including intrinsic, trait and action monotheism, and in fact, they are unable to understand and prove true monotheism, and one can not deduce from their words and views the true Quranic monotheism. In the discussion of unity of traits, they suffer from paradox, closure, and characterization. This claim has been proved by providing sufficient evidence of their views about the unity of traits and also by analyzing their intellectual foundations. If a person makes a will to perform a pilgrim, when one-third of his property is insufficient to perform the pilgrimage, this question will arise as to how the cost of Hajj is calculated from the principle of the whip of the deceased individual, or from one third of his property, which in the latter case, more than one third of the property needs the permission of the heirs of the deceased person. In present article, we try to present a remarkable attention to this issue by answering this question: what will be the differences in the estimation of Hajj costs as to different kinds of will for Hajj in terms of Istihbab and religious offerings. Therefore, with an analytical look, we will examine the detailed critique of the evidence, and the result is that, in the will to perform the Hajj, absolutely, without stating the payment of one third of the property, the payment will be from the whole of the property. However, the payment of the Umrah Hajj's expenses, in contrast to the obligatory Hajj, is not paid out of the whole property.
. Master of jurisprudence and the principles of Islamic law from the Farabi University of Tehran. Studying "Kharej" at Qom Seminary. Email: ahmadsaberimajd@gmail.com.